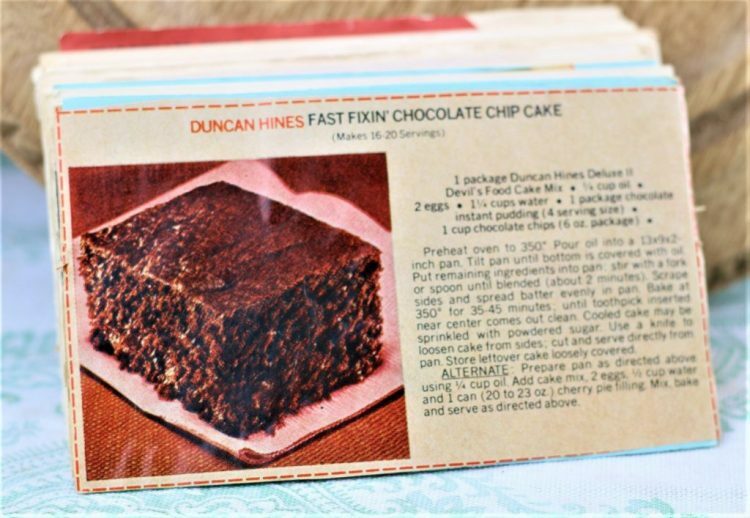 Front of the recipe card for Duncan Hines Fast Fixin Chocolate Chip Cake. 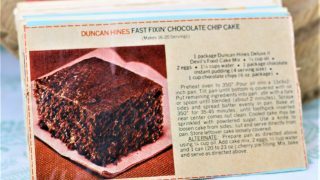 There are lots of fun recipes to read in the box this recipe for Duncan Hines Fast Fixin Chocolate Chip Cake was with. Use the links below to view other recipes similar to this Duncan Hines Fast Fixin Chocolate Chip Cake recipe. If you make this Duncan Hines Fast Fixin Chocolate Chip Cake recipe, please share your photos and comments below! Pour oil into a 13x9x2-inch pan. Tilt pan until bottom is covered with oil. Put remaining ingredients into pan; stir with a fork or spoon until blended (about 2 minutes). Scrape sides and spread batter evenly in pan. Bake at 350° for 35-45 minutes; until toothpick inserted near center comes out clean. Cooled cake may be sprinkled with powdered sugar. Use a knife to loosen cake from sides; cut and serve directly from pan. Store leftover cake loosely covered. ALTERNATE: Prepare pan as directed above using ¼ cup oil. Add cake mix, 2 eggs, ½ cup water and 1 can (20 to 23 oz.) cherry pie filling. Mix, bake and serve as directed above.